Crouse-Hinds Straight form F cord connector in electrogalvanized aluminum acrylic painted finish, has Feraloy® iron alloy construction for durability. It has a trade size of 2-inches. 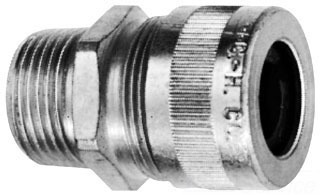 The NEMA-3R rated connector with male threaded connection, accommodates conductor size ranging from 1.875 to 2.188-inches. It has thread length of 0.813-Inch, gland length of 2.563-inches, 3.813-Inch width across corner and 2.563-Inch width across flats. It is suitable for use with non-armored cable and tray cable. Cord connector meets cULus E23223, Class I, Division 2, Groups A,B,C,D, Class II, Division 1, Groups E,F,G, Class II, Division 2, Groups F,G, Class III standards.